I am coming up on a milestone, my twenty-year High School graduation-anniversary. Some would say 20 year High School Reunion but, alas, there will be none of that for us. I graduated from a small DoD School at the now closed Keflavik NAS, Iceland. Thank you for the memories! Funny how this post from Wife on the Roller Coaster suddenly triggered one for me out of the blue. June 7, 1992, I graduated from high school in the middle of my /final/ pcs as a military-brat. We hopped on a plane back to the states June 10, 1992. There were moves after high school. Mom and Dad PCSed two times while I was in college (and once more after I graduated college) but this was the last one that I was a major part of. This was not your typical high school graduation. There I was graduating from high school and our household goods in a crate bound from Keflavik NAS, Iceland to Annandale, Virginia. Not only was I saying good-bye to high school friends, most for a final time (although I did and continue to get together with some of my closest friends) but I was also saying good bye to a house, a lifestyle, closing a chapter in my military-brat life all in the span of a few days. Funny the impact those three little letters, PCS, have on a military family… ah the memories. Would I change anything as a Military Brat? Not a chance! Do I know I missed out on some of the stability of your typical American-Child. You know I do. Sometimes I wish I had that stability. But then I remember what I've seen, what I've done, where I have travelled, who I have met. Nope, I wouldn't change a thing! April is in a week and it is Month of the Military Child. This is a great opportunity to say thank you to the military children in your life. Recognize their sacrifice. Realize that they have been formed into the person they are because of their dad's or mom's service. Appreciate their service, their sacrifice, their resilience. 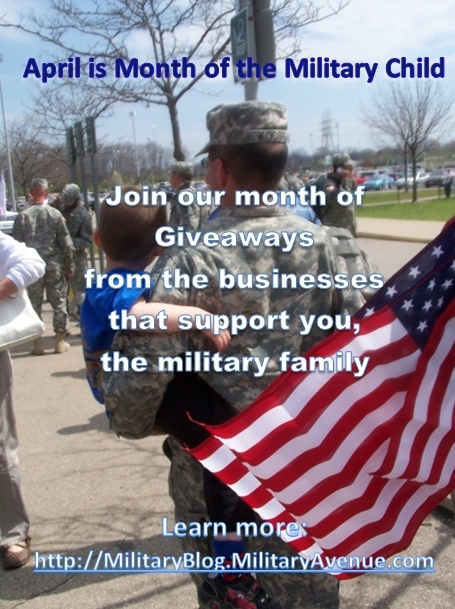 Next week we will begin some great giveaways for our military families in honor of Month of the Military Child. Be sure to visit our blog often to learn about that week's giveaways. Follow us on Facebook, Twitter or Pinterest. We will let you know what is going on providing encouragement, empowerment and, yes, giveaways too! Thank you! I will share with my readers! I am an army wife. My husband is currently deployed and we have 5 wonderful kiddos! (4-10). It amazes me the strength Military kids have! Thanks for the giveaways and reconizing our wonderful military kids!! !